name, address and quantity of books. Buddy Rich performed hundreds of concerts a year, participated in large film productions with world-famous artists and appeared on countless TV shows. He had his own big bands, trios, quartets, quintets, tap-danced and sang, and played with symphony orchestras. He did every­thing. Follow a fantastic musician during his whole lifetime and read what many musicians, producers, tourleaders, arrangers, relatives and many more say about him. This book contains more than 100 photos and will give you an insight in all the big bands he played with: everyone from Joe Marsala, Bunny Berigan, Artie Shaw – to Tommy Dorsey and Harry James. And read about his time with Jazz at the Philharmonic and the famous drum battle with Gene Krupa in 1952! 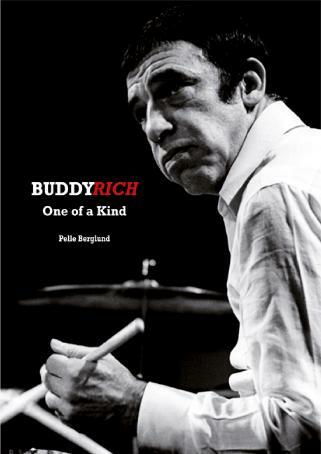 This book will show many different sides of Buddy Rich – not only the image that is shown everywhere: the angry and sometimes ruthless drummer. Buddy Rich was so much more and the reader will hopefully better understand the incredible pressure he played under. Wherever he came, the audience expected him to perform the best solo they had ever heard, because on stage was – The World’s Greatest Drummer. Buddy Rich. One of a Kind.